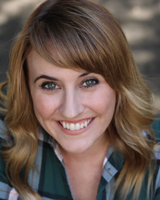 Katie can currently be seen performing at schools all over Southern California with The Imagination Machine, as well as onstage at Disney’s California Adventure in Frozen: Live at the Hyperion. She has appeared as Jane in TARZAN (3D-Theatricals,) Frauelin Kost in CABARET (Crown City Theatre Co.,) Suzy in THE MARVELOUS WONDERETTES (Sierra Rep and Candlelight Pavilion,) Amber in HAIRSPRAY (Sierra Rep,) a Silly Girl in BEAUTY AND THE BEAST (3D-Theatricals,) and most recently she spent her holiday season performing with the Troubadour Theatre Company in THE LITTLE DRUMMER BOWIE (The Falcon Theatre.) She has performed over/on the seas for Disney in Tokyo and as an original cast member aboard The Disney Fantasy. Film and Television credits include Disney’s The Parent Trap and NBC’s Brave New World. Proud member, SAG/AFTRA/AEA.